#DeLima still has pending motion to quash charges before the RTC, w/c means the case could still be dismissed after hearing. Arrest warrant vs Sen #DeLima doesnt mean she's already guilty of charges. It's only for arraignment, start of trial process. Presidential spokesperson Ernesto Abella is quoted as saying that De Lima's detention at the Custodial Center is only a "temporary" situation. 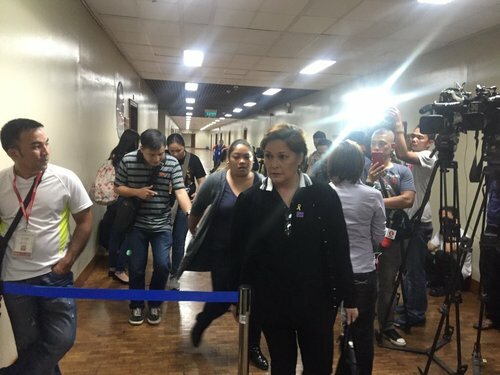 Sen. Leila de Lima will be detained at the Philippine National Police's Custodial Center where former senators, Jinggoy Estrada and Bong Revilla, are also detained over plunder charges linked to the pork barrel scam. Sen Leila de Lima already at Camp Crame. She was arrested at around 8 am. Pimentel says De Lima is still free to go around the Senate premises. Arrest has been deferred for tomorrow, Friday. Senate President Koko Pimentel, meanwhile, urges the arresting team not to worry as De Lima herself has vowed to surrender voluntarily tomorrow morning. "Kung maisilbi yung warrant of arrest bukas, may naka assign na kaming mga tao na isasama bukas," Balajadia tells DZRH. M/Gen. Jose Balajadia Jr. tells DZRH news that the CIDG arresting team has agreed with the Senate sergeant at arms that De Lima will instead be arrested tomorrow (Friday) morning. Justice Secretary Vitaliano Aguirre tells a radio program that he thinks it's more comfortable for De Lima to sleep inside her jail cell at the PNP Custodial Center than at her office. A staff of Senate President Koko Pimentel says the CIDG team is meeting with the OSAA. De Lima says that while she has had an arrangement with Interior Secretary Sueno, it is likely someone higher than Sueno overruled the arrangement (implying that it was President Duterte himself). 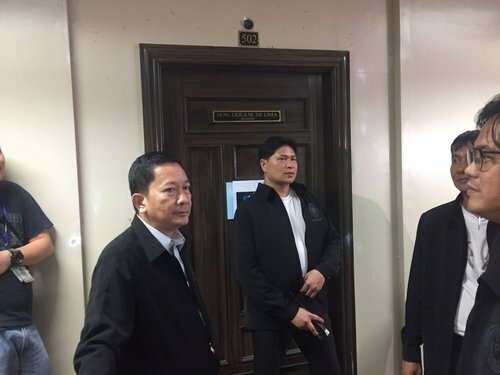 A report says the Senate sergeant at arms is speaking with the CIDG officers who arrived to serve the warrant to De Lima. Elements of the CIDG, meanwhile, have arrived at the Senate premises purportedly to serve De Lima the warrant. Meanwhile, international human rights group Amnesty International releases a statement condemning the arrest of De Lima as "politically motivated." "The arrest of de Lima is a blatant attempt by the Philippine government to silence criticism of President Duterte and divert attention away from serious human rights violations in the 'war on drugs'." De Lima's lawyer, Alex Padilla, tells ANC that she will not resist arrest if it proceeds tonight. The arresting team of the CIDG, meanwhile, proceed to the Senate. Sen. De Lima now back inside her office, awaiting the next moves of the CIDG. De Lima: Kung gagalangin nila ang Senado bilang institution, hindi nila ako aarestuhin. Hintayin na lang nila ako dyan sa labas. De Lima: 'Wag naman nila sana ako arestuhin ngayong gabi. I feel less safe. De Lima cites reports that it was police chief Bato dela Rosa who ordered that the arrest warrant be served tonight. De Lima: Hindi na ako naabutan ng mga anak ko. De Lima says she returned to the Senate because she does not want her family to see her being taken by authorities. 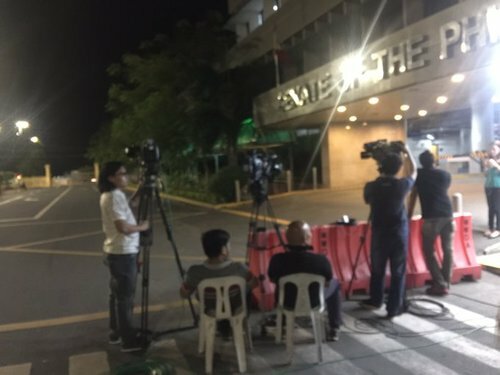 De Lima says she will stay in the Senate premises overnight. De Lima says they arranged earlier with the CIDG to let her spend the night at home, but this changed at the last mnute. De Lima faces the media: Kaunti naman sanang respeto.